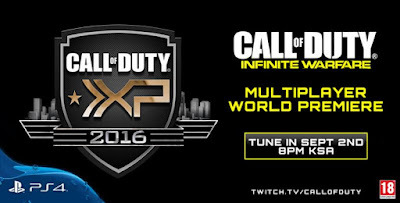 Broadcasted live from Los Angeles with world first Call of Duty Infinite Warfare multiplayer reveal, starting on September 2nd at 7pm Dubai, U.A.E. time and 8pm KSA time. Call of Duty fans, prepare for the biggest gathering of the global Call of Duty® community, asActivision Publishing, Inc., a wholly owned subsidiary of Activision Blizzard, Inc. (Nasdaq: ATVI), presents Call of Duty XP, the ultimate interactive experience andfan celebration, taking place at the Forum in Inglewood, California, September 2 - 4. Call of Duty XP 2016 will bring the thrilling finals to the Call of Duty World League Championship, Presented by PlayStation®4 and played on Call of Duty: Black Ops III, as well as the reveal and first hands-on for Call of Duty®: Infinite Warfare multiplayer, Call of Duty: Modern Warfare Remastered multiplayerand new Call of Duty: Black Ops III Downloadable Content. Fans will also get to play the first Call of Duty VR experience on site, and will have other 'you-had-to-be-there' live action experiences inspired by Call of Duty, including Nuketown paintball, Zombies laser tag and other fun. The epic Call of Duty XP festivities center around the eagerly-awaited Call of Duty World League Championship, Presented by PlayStation®4, the culmination of the inaugural season of the Call of Duty® World League (CWL), Presented by PlayStation®4. After nearly a year of tough competition from across the globe, 32 of the top teams worldwide will compete for more than $2 million in prizing, as part of the CWL's 2016 prize pool which tops $3.5 million. Both prizes are the largest in Call of Duty history. After setting viewership records for Call of Duty competitive events during the Stage 1 Finals, the CWL is moving toward the highly-anticipated Stage 2 Finals, where the first Call of Duty World League Championship qualifiers will be determined. Major League Gaming is the official tournament operator of the Call of Duty World League Championship, Presented by PlayStation®4. Fans can watch the excitement unfold live in game (Black Ops III PS4) via the Live Event Viewer, MLG.tv on the web and mobile devices, and at www.callofduty.com. Additionally, live at Call of Duty XP, thousands of eager fans will witness the world-premiere of Call of Duty: Infinite Warfare multiplayer, and be the first in the world to go hands-on with multiplayer as well as Infinity Ward's all-new cooperative zombies mode. Attendees will also be the first to play Call of Duty: Modern Warfare Remastered multiplayer. Fans have the rare opportunity to play the latest Call of Duty games before their highly-anticipated November 4th release. Additionally, further reflecting the full breadth of the Call of Duty franchise, attendees will be among the first to play new downloadable content for Call of Duty: Black Ops III. All Call of Duty XP attendees will have the chance to compete for prizes by showcasing their skills in 6 vs. 6 competitive matches, as more than 500 gameplay stations will be set up on site for fans to enjoy. "Call of Duty XP is going to be the biggest Call of Duty fan celebration in history," said Eric Hirshberg, CEO of Activision Publishing. "The best Call of Duty players in the world will be front and center trying to win the first Call of Duty World League Championship at what is sure to be our biggest Esports event ever. Plus, fans will be able to see and play more hands-on content and reveals in one place than we've ever had, from Infinite Warfare, to Modern Warfare Remastered to Black Ops III DLC. Plus, there will be an off-the-charts list of Call of Duty inspired activities that you can't experience anywhere else."